May 22, 2018 | Like this? Share it. Healthcare-Associated Infections (HAIs) have become one of the biggest threats to patient and staff safety within the healthcare industry. Studies show that 1 of 25 hospitalized patients are affected by an HAI. However, efforts can be made to reduce the risk of HAIs through the development of barrier management and stringent cleaning protocols. Together with healthcare and public health partners, the CDC is working to bring attention to HAIs and looking for the right solutions to reduce the risk of recurrence. Studies show that when staff and practitioners are aware of infection control issues and take the proper precautions, rates of some targeted HAIs may be reduced by 70%. monitor the effectiveness of the entire strategy. Containment and air quality control help to prevent the passing of microbes and particulates from a compromised area to a clean space and/or to patients and staff. 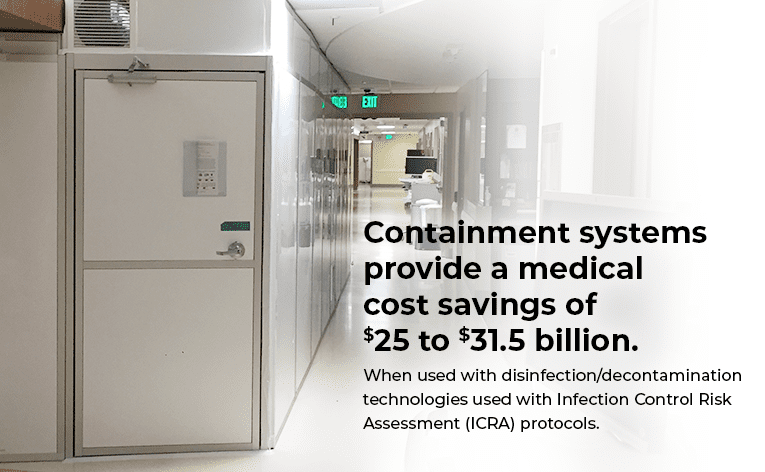 Utilizing containment systems with disinfection/decontamination technologies in tandem with the development of Infection Control Risk Assessment (ICRA) protocols provides optimal risk management and infection control results. Research shows that by implementing these practices, the medical cost savings is in between $25 to $31.5 billion. At STARC Systems, it is our goal to support the reduction of HAIs by providing industry-leading containment technologies for improved risk management and infection control.